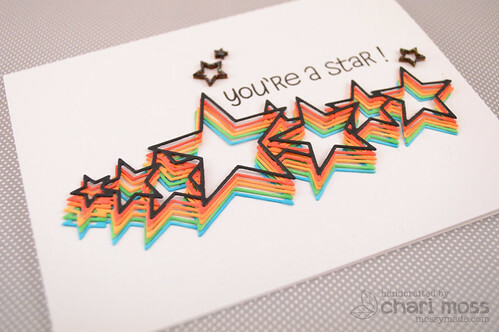 I cut multiple die cuts from Neenah white card stock then colored them with copic markers. I could have cut from color card stock but I was away from my regular craft area at a retreat and didn't have colored card stock with me so I improvised. I layered all my colored die cuts by off setting them slightly then I added the black one on top. I layered them together before adhering them to the card base so I could center it as an entire element rather that trying to figure out where the final die cut would end up. It was also easier to glue them together this way too and keep my card base nice and clean from glue. 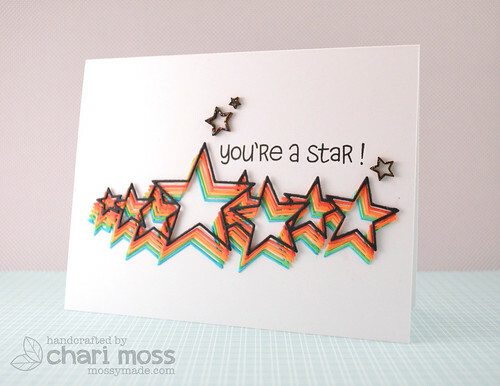 The sentiment is from Lawn Fawn's Lucky Stars stamp set and I used wood veneer stars by Studio Calico colored black with a little bit of Stardust stickles on top. Terrific card! That star die is on my wish list! love what you did as usual! looks amazing!